Baseball fever! 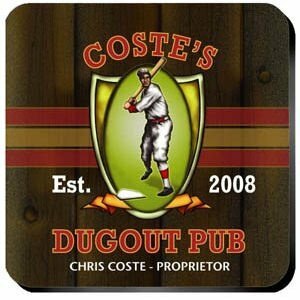 These classic style personalized coasters feature a full-color image of a retro baseball player getting ready to hit it out of the park. Use these coasters with their cork backing and mahogany caddy to protect your furniture before, during and after baseball season. The design is customized with a first name, last name and year the Dugout Pub was established.